The TB/HIV Working Group is one of the seven working groups of the Stop TB Partnership, comprising a large network of stakeholders from international organizations, donors, academia, and nongovernmental and governmental organizations from a range of different countries. It is committed to reducing the global burden of HIV related TB through effective collaboration between National TB and AIDS Control programmes and other stakeholders, and through the generation of evidence based policy and programme guidance in order to achieve the global TB/HIV targets set for 2010-2015 in the Global Plan to Stop TB. The Global Plan goal is to halve the number of deaths from TB among HIV-positive people, compared with 2004 levels. Ambassador Eric Goosby, MD was announced as the new Chair of the Global TB/HIV Working Group at the 19th Core Group meeting held in Washington on 11-12 February 2014. Having stepped down from his position as United States Global AIDS Coordinator (2009-2013) where he led all US Government international HIV efforts, he is currently heading a new centre on implementation science at University of California, San Francisco’s Global Health Sciences. Ambassador Goosby’s 30 years of experience in HIV began at San Francisco General Hospital; he became associate medical director of the AIDS Clinic in 1987. During the Clinton administration, he served as Deputy Director of the White House National Policy Office and Director of the Office of HIV/AIDS Policy of the US Department of Health and Human Services. From 2001 until 2009, Ambassador Goosby was CEO and Chief Medical Officer of Pangaea Global AIDS Foundation, playing a key role in the development and implementation of HIV/AIDS national treatment scale-up plans in Rwanda, South Africa, China, and Ukraine. As US Global AIDS Coordinator, he worked hard to advance the TB/HIV agenda, improve its visibility and ensure its prominence in the PEPFAR Blue Print for an AIDS Free Generation. He has also served on the Board of the Global Fund, representing the US Government. Ambassador Goosby’s new appointment offers an ideal opportunity to further enhance the global TB/HIV response and optimise coordination and action between key TB and HIV stakeholders to catalyse and intensify country level scale-up. The World Health Organization convened the 19th Core Group meeting of the Global TB/HIV Working Group from 11th - 12th February 2014 in Washington DC. The meeting was co-chaired by Diane Havlir, the outgoing Chair of the Global TB/HIV Working Group and Ambassador Eric Goosby the new incoming Chair. Meeting participants critically reviewed the past ten years of global progress in implementation and science in preventing, diagnosing and treating HIV-associated TB. They also identified essential next steps including enablers for advancing the TB/HIV response particularly at country level to eliminate TB deaths among people living with HIV. Innovative ideas to address unmet research needs in prevention, diagnosis and treatment of TB among people living with HIV were also shared for shaping the global research agenda. The detailed agenda and presentations can be found at the links below and a more detailed report will be posted up in due course. The World Health Organization, supported by the President's Emergency Plan for AIDS Relief (PEPFAR), convened a regional TB/HIV Implementation Workshop followed by the 18th Core Group meeting of the TB/HIV Working Group of the Stop TB Partnership from 10th - 12th April 2013 in Maputo, Mozambique. The event brought together more than 120 participants, comprising key international partners as well as regional and national HIV and TB stakeholders including community and civil society representatives from 14 countries in the African region. Countries represented included Botswana, Ethiopia, Kenya, Lesotho, Malawi, Mozambique, Namibia, Nigeria, South Africa, Swaziland, Uganda, United Republic of Tanzania, Zambia, and Zimbabwe. The aim of the workshop was to review progress in implementation and promote strategies to increase access to early ART for people living with HIV and active TB and to accelerate the scale-up of the Three Is for HIV/TB in the African Region. Participants also shared best practices and identified priority actions for scaling up, and monitoring and evaluating the implementation of collaborative TB/HIV activities. For a brief overview of activities carried out by the Secretariat and the Working Group, and events planned for the coming months, please read the latest "Message from the Chair and the Secretariat" on our TB/HIV Updates page. The World Health Organization and the Consortium to Respond Effectively to the AIDS/TB Epidemic (CREATE) convened their 7th CROI-affiliated HIV/TB research meeting on behalf of the TB/HIV Working Group of the Stop TB Partnership in Atlanta, Georgia USA on 3 March, 2013. The meeting discussed critical knowledge and research gaps on TB prevention among children and adults and drug interactions between new TB drugs and ART. Attended by some 100 participants, the meeting was convened by Dr Haileyesus Getahun of WHO and co-chaired by Dr Diane Havlir of UCSF and Chair of the Global TB/HIV Working Group and Dr Richard Chaisson, of Johns Hopkins and Director of CREATE. Thanks to efforts by Working Group and Core Group members over the years in raising the profile of TB/HIV at CROI, there was a record number of abstracts at the main CROI conference this year including late breakers on TB and one full day of TB discussions as well as increased mainstreaming of TB discussions in all the critical areas of HIV care including basic science. For more details on the HIV/TB Research meeting and for a brief summary with links to the key TB-related studies presented, please visit the following link. 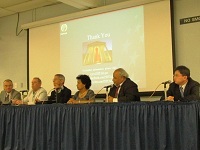 The World Health Organization, in collaboration with Georgetown University, organized a high level international consultation on behalf of the TB/HIV Working Group of the Stop TB Partnership, in conjunction with the AIDS 2012 conference in Washington DC on July 21, 2012. The aim of the meeting was to discuss innovative ideas and ways to define and shape the global TB/HIV response for the next decade. It also harvested experiences and identified key challenges and barriers in the scale-up of collaborative TB/HIV activities, including key research gaps. Co-hosted by Diane Havlir of the University of San Francisco and Chair of AIDS 2012 and the TB/HIV Working Group, and Mark Dybul of Georgetown University and George W Bush Institute and former US Global AIDS Coordinator, and convened by Haileyesus Getahun of the Stop TB Department of WHO, the meeting was attended by some 130 participants, including opinion leaders, global policy makers, leading scientists, activists and national HIV and TB programme managers. The morning session opened with presentations and a high level panel discussion comprising Anthony Fauci, Director of the National Institute of Allergy and Infectious Diseases, Gottfried Hirnschall, Director of WHO’s HIV/AIDS Department, Mark Harrington, Executive Director of Treatment Action Group, Debrework Zewdie, Deputy Executive Director of the Global Fund and Eric Goosby, the US Global AIDS Coordinator. Meeting participants also reviewed global and regional progress as well as key challenges and experiences in the scaling up collaborative TB/HIV activities, presented by Director of the Bureau of Disease Control’s Division of HIV/AIDS Prevention and Management of the People’s Republic China, Xia Gang, and by the National Programme Officer of the National AIDS Control Organisation of India, BB Rewari. New evidence, actions and prospects for the next ten years on prevention, diagnosis and treatment were presented by Richard Chaisson, Professor at Johns Hopkins University in Baltimore; Stephen Lawn, Reader in Infectious Diseases and Tropical Medicine at the London School of Hygiene and Tropical Medicine and Associate Professor at the University of Cape Town; and Moses Kamya, Associate Professor at Makerere University, Uganda. In addition, neglected areas such as childhood TB, HIV related TB in prisons and the convergence of drug use and hepatitis in drug users were presented by Soumya Swaminathan, Assistant Director of India’s Tuberculosis Research Centre; Stewart Reid, CIDZ’s Medical Director and Associate Professor with the University of Alabama at Birmingham; and Chris Beyrer, Associate Director of Public Health at Johns Hopkins Center for Global Health, respectively. For the meeting presentations and meeting agenda please visit the links below. Thanks to efforts of the TB/HIV Core Group and Working Group and with the strong support of the Diane Havlir, Chair of the TB/HIV Working Group and co-chair of AIDS 2012, the IAS conference programme this year was packed full of TB/HIV. There was a record breaking number of well attended sessions focussing on TB, including late breakers, workshops, oral abstract sessions and satellite symposia, posters and global village activities. The TB coverage culminated in Friday’s superb plenary presentation given by Anthony Harries of the Union, followed by a special session on Looking to the Future in HIV and TB, with participation from the Core Group members, Diane Havlir, Richard Chaisson, Haileyesus Getahun and Mark Harrington. The meeting concluded with an impassioned call for action by Whoopi Goldberg to join together to tackle HV and TB as one disease. For webcasts and presentations of all the TB/HIV sessions at AIDS 2012, please visit the conference TB/HIV roadmap which provides links to all the sessions. For photos and articles surrounding the breaking science at AIDS 2012, please visit our Facebook page. The Global Tuberculosis Community Advisory Board (TB CAB) is dedicated to increasing community involvement in TB research and to mobilizing political will regarding key TB product development issues. The TB CAB is comprised of research activists from all over the world, who are extensively involved in HIV and TB research networks. Read more about the TB CAB on their new website TB Online http://www.tbonline.info/ This website provides information for activists, patients health workers and researchers working to end tuberculosis. The theme of this year’s World TB Day 2012 is "Stop TB in my lifetime" with a special focus on childhood TB. It is very clear we need to take full advantage of each and every approach and intervention available to us in order to achieve this inspiring goal. One of the critical areas is the HIV/TB combined epidemics. HIV is not only a major risk factor for tuberculosis, but children with HIV are at markedly increased risk of TB. Just a month ago, we launched the updated WHO policy on collaborative TB/HIV activities. We estimate that nearly 1 million lives have been saved between 2005-2010 thanks to implementation of TB/HIV collaborative policies in countries. Thus, the importance of implementing the new Policy, and in particular, in addressing the needs of most-at-risk and key populations, such as women and children must be emphasized. Delivery of the Three I’s for HIV/TB (including isoniazid preventive treatment, infection control for TB, and intensified case finding for TB) and earlier antiretroviral treatment for eligible people, including women and children, can dramatically reduce the number of new cases, saving millions of lives in the coming years. TB is both preventable and curable in women and children, regardless of HIV status. The Three I’s for HIV/TB and earlier ART significantly reduce the risk of TB. Today the Journal of Infectious Diseases has published a scientific review on the magnitude and challenges of maternal and childhood TB in high TB and HIV burden settings together with related recommendations for policy, programming and research. It provides further in-depth evidence on the scope of the problem, as well as opportunities we have at hand to overcome the challenges. Recommended actions are also outlined in the brochure: No More Crying, No More Dying. Towards Zero TB Deaths in Children which was released on Wednesday. We would like to thank you and congratulate you - all our stakeholders - for the past success in addressing HIV/TB through collaboration. And we urge you to make every effort this year to ensure that collaborative TB/HIV activities become a firm and integral part of all HIV and TB services including, prevention of mother-to-child transmission programmes, prenatal care, family planning and immunization services. This would be an incredible step forward towards getting to zero TB deaths in children. The World Health Organization and Consortium to Respond Effectively to the AIDS/TB Epidemic (CREATE) organized their 6th CROI affiliated HIV/TB research meeting on behalf of the TB/HIV Working Group of the Stop TB Partnership in Seattle, USA on 5 March, 2012. Attended by some 70 participants, including HIV researchers, implementers and public health policy makers, the meeting discussed critical knowledge and research gaps on TB impact and measurement of TB transmission in high HIV burden settings. Convened by Drs Richard Chaisson of John Hopkins University and Haileyesus Getahun of WHO’s Stop TB Department, the meeting was chaired by Dr Diane Havlir, Chair of the TB/HIV Working Group and Dr Gottfried Hirnschall, Director of the HIV/AIDS Department of WHO. For more information please click on the links below. Following on from the success of the Interim Policy published in 2004, WHO has today launched its revised policy on collaborative TB/HIV activities. The new policy is based on the latest scientific evidence generated from randomized controlled trials and observational studies in the field of TB and HIV and country experiences implementing the Interim Policy. The Interim policy provided a highly effective framework for implementing partners and donors to focus their resources. More than 100 countries fully adopted the Interim Policy, measured by HIV testing of at least half of TB patients identified and it is estimated that 910,000 lives have been saved globally. The increased uptake of the interim policy has resulted in more than 60% of the total number of TB patients estimated to have HIV were diagnosed and registered in HIV care in 2010, compared with less than 15% in 2005. TB screening among people living with HIV increased 12-fold from 200 000 in 2005 to 2.3 million in 2010. The number of people living with HIV without active TB receiving isoniazid-preventive therapy increased from 26 000 in 2005 to 180 000 in 2010. The new policy emphasises the importance of establishing mechanisms for the delivery of integrated TB and HIV services at the same place and time, as well as promoting integration within other health programmes such as maternal and child health and harm reduction services. The update is a compilation of existing WHO guidelines for addressing HIV-related TB. 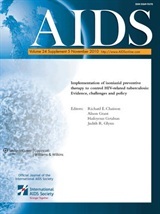 It also includes extensive reviews of the evidence on key questions such as the benefits of HIV testing in patients with presumptive or diagnosed TB, and their partners and families; co-trimoxazole preventive therapy for TB patients living with HIV; earlier initiation of ART at CD4 count higher than 350 cells/mm3 for TB prevention; and models of integrated TB and HIV services. Implementation of this revised Policy will enable us to make major advances in our efforts to overcome HIV and TB epidemics as set out in the Global Plan to Stop TB and the Global health sector strategy on HIV/AIDS, 2011-2015. World AIDS Day this year is about "Getting to Zero. Zero New HIV Infections. Zero Discrimination and Zero AIDS Related Deaths". With almost one in four HIV related deaths attributable to TB globally and up to 50% in some settings, there is no question that TB prevention, diagnosis and treatment will contribute towards zero AIDS related deaths. Thanks to your efforts and commitment, we have observed encouraging progress in the scale-up of collaborative TB/HIV activities recently. The uptake of HIV testing and counselling for TB patients in the African and European regions has been particularly impressive. Similarly in 2010, almost 60% enrolled into HIV care were screened for TB in the African Region, and nearly one out of four eligible people enrolled in HIV care were put on Isoniazid preventive therapy. However, despite evidence based recommendations for providing ART to all TB patients, regardless of CD4 count within the first two weeks of their TB treatment, less than half of the TB patients who were identified with HIV received life saving ART. In the spirit World AIDS Day, we call upon all members of TB/HIV Working Group and friends of TB/HIV to ensure the delivery of integrated TB and HIV services including life saving ART to all people living with HIV. On 6th July WHO, in collaboration with the Global TB/HIV Working Group of the Stop TB Partnership, regional members of civil society, Treatment Action Group and UNAIDS, convened a meeting aimed at empowering civil society from 15 Latin American and Caribbean countries to advocate for increased access to collaborative TB/HIV services in the region of the Americas. A publication outlining the new epidemiological model - Time to act: Save a million lives by 2015 - Prevent and treat tuberculosis among people living with HIV was launched on 6th June in New York as world leaders were convening for the UN High-Level meeting on AIDS. The new model, developed by the World Health Organization, the Stop TB Partnership and UNAIDS, shows it is possible to reduce dramatically HIV/AIDS deaths through TB prevention and treatment. In 2009 almost one in four deaths among people living with HIV were due to TB. The majority of these deaths could have been avoided as TB is both curable and preventable. The model estimates that through the scaled-up implementation of WHO-recommended collaborative TB/HIV activities, it is possible to save a million lives by the end of 2015. In 2010 a joint goal for 2015 was set by the Stop TB Partnership and UNAIDS to halve HIV related TB deaths, compared to 2004 levels. Based on the new model it has been agreed to aim to save a million lives. “Halving TB deaths in people living with HIV by 2015 is possible and is within our reach. We could save up to a million lives by 2015 and bring us one step closer to the UNAIDS vision of Zero AIDS deaths” said UNAIDS Executive Director Michel Sidibé. Testing for HIV and TB should be provided every three years in places where both diseases are prevalent. Prompt TB treatment needs to be provided to every person living with HIV with active TB - or else treatment to prevent TB. HIV and TB treatment must be accessible and of good quality so that people living with HIV are cured of TB. Antiretroviral therapy (ART) should be started early, which will help prevent TB, since people living with HIV are far less likely to become ill with and die of TB if they begin ART before their immune systems begin serious decline. People who are HIV-positive and diagnosed with active TB should start ART regardless of the status of their immune systems. The cost of implementing all the elements needed to achieve this is estimated to come to around $790 million a year. Dr Mario Raviglione, Director of the Stop TB Department of WHO said “In the past few years we have made encouraging progress in the fight against TB and also gained clear understanding of what needs to be done to prevent a million deaths from TB among people living with HIV by 2015. Now is the time to apply that knowledge and further intensify our efforts starting with bold leadership of national governments”. This was further echoed by Dr Jorge Sampaio, the UN Secretary-General's Special Envoy to Stop TB and former President of Portugal, who made a strong appeal during the launch of the publication “There is a surge in awareness about the deadly TB epidemic among people living with HIV, but insufficient action. Now new scientific work has shown that we can prevent a million deaths among people living with HIV by end 2015 by providing integrated HIV and TB care. I call on the world’s leaders to take up this challenge. It is time to take bold action. Not to do so would be an outrage." The Stop TB Department of the World Health Organization and the Consortium to Respond Effectively to the AIDS/TB Epidemic (CREATE) organized an HIV/TB research frontiers meeting on behalf of the TB/HIV Working Group of the Stop TB Partnership affiliated with the 18th Conference on Retroviruses and Opportunistic Infections (CROI 2011) in Boston, USA on 27 February, 2010. This was the fifth in a series of annual meetings organized by WHO and CREATE in conjunction with CROI. 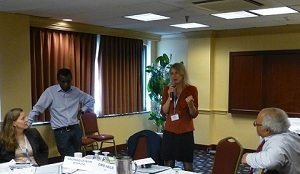 The meeting was co-chaired by Dr Diane Havlir, the chair of the TB/HIV Working Group and Dr Richard Chaisson from Johns Hopkins University and CREATE, and was attended by about 80 HIV researchers and policy makers, including Ambassador Eric Goosby, the United States Global AIDS Coordinator. The main objective of the meeting was to discuss emerging and unpublished data about the new Xpert MTB/RIF diagnostic tool and explore its implication in the diagnosis of TB among people living with HIV. The meeting also discussed the implication of the mouse model for the development of new TB drugs and explored its implication for people living with HIV. Dr Catharina Boehme from the Foundation for Innovative New Diagnostics (FIND) presented previously published and unpublished data on Xpert MTB/RIF, which has the sensitivity of a single Xpert test under routine conditions of 99% and 80% in smear positive culture positive and in smear negative culture positive specimens respectively. The performance of the test was not affected by HIV status. The use of Xpert resulted in shortening of time to case detection and treatment, and improved reporting of results as compared to routine practices. Preliminary results also showed that Xpert MTB/RIF perform better in those children living with HIV compared to HIV negative children. Results from preliminary studies also showed that Xpert performance is higher when used on extrapulmonary specimens except for cerebrospinal fluid. (See also a poster presented at the main conference describing the performance of Xpert MTB/RIF on fine-needle aspiration specimens with a sensitivity and specificity of 100% and 93.8% respectively (Van Rie, abstract 879, CROI 2011). Dr David Katzenstein of Stanford University, USA commented on Dr Boehme's presentation and underlined the role of the test in preventing the loss to follow up of patients after the first sputum test. He also urged on the importance of including INH resistance detection in the Xpert test. Dr Eric Nuermberger of Johns Hopkins University presented data on the use of mouse model to develop new TB drugs and regimens and discussed its implication for people living with HIV. He described that the pathological differences between mice and humans have raised concerns about the "predictiveness" of mouse models in the development of new TB drugs. Nonetheless, mouse models represent the activity of existing TB drugs well and their careful use can inform TB drug development. Dr Annie Luetkemeyer from the University of California, San Francisco commented on the need to include people living with HIV in clinical trials and to improve surrogate markers to better predict the potency of new drugs and regimens. The results of two randomized control trials on when to start ART in TB patients living with HIV were presented at the main conference. The STRIDE study compared immediate ART (2 weeks after TB treatment initiation) to early ART (within 8 to 12 weeks) among 806 people living with HIV with CD4 count <250 celles/mm3 recruited from study sites in Africa, Asia, Latin America and North America. The SAPIT trial compared two integrated arms of early (ART initiated within 4 weeks of TB treatment initiation) and late therapy (ART initiated within the first 4 weeks of the completion of TB treatment continuation phase i.e. at 12 weeks). Both studies showed that combined and earlier ART and TB treatment reduces death and AIDS related events with more pronounced effect among those people with CD4 count less than 50 cells/mm3. Death and AIDS events were significantly reduced in the immediate than the early arm in those with CD4 count <50 cells/mm3 by 42% and 68% in the STRIDE and SAPIT trials respectively. TB IRIS was significantly higher with immediate ART than early ART but no deaths were attributed to IRIS. A symposium entitled "Colliding epidemics: Controlling HIV-related TB" and co-convened by Drs Haileyesus Getahun of the Stop TB Department of WHO and Connie Benson of University of San Diego reviewed the management of patients requiring treatment for both TB and HIV diseases, advances in TB diagnostics among people living with HIV, the use of preventive TB therapy, and the challenges and progress in understanding the immune response to TB infection for vaccine development. These new guidelines were launched on 1st December, World Aids Day and aim to provide guidance to national AIDS and tuberculosis programmes and those providing HIV services to accelerate the nationwide implementation of IPT and ICF. They include evidence-based recommendations for adults, children and infants living with HIV, address implementation issues and identify key research gaps in order to scale up TB prevention, diagnosis and treatment as a core component of HIV prevention, treatment and care. They are aimed at policy-makers and health programme managers, governments, nongovernmental organizations, donors and patient support groups working in the field of HIV/AIDS and TB, and health-care workers providing care for people living with HIV. The new guidelines can be accessed here.